Happy New Year from Lamattina with Celery Sorbet! Admitting to a sweet tooth these days seems rather illicit, what with sugar cast in the role of Public Enemy No. 1. But here is my confession: I rarely go a day without a slice or bite or square of something sweet. If it’s not cake, then it’ll be a cookie, a slice of tart topped with fruit or a slab of dark chocolate, a little pop of joy to accompany a short black coffee or a tall cup of green tea. But it’s not the sugar I’m addicted to. Rather, it’s the comfort, surprise and delight that dessert, or any food, can bring, that ideal match of the right dish and the right moment. Something sweet… yes. Celery, yes. Sorbet, yes. But celery and sorbet together? We admit we’ve never heard of it either. 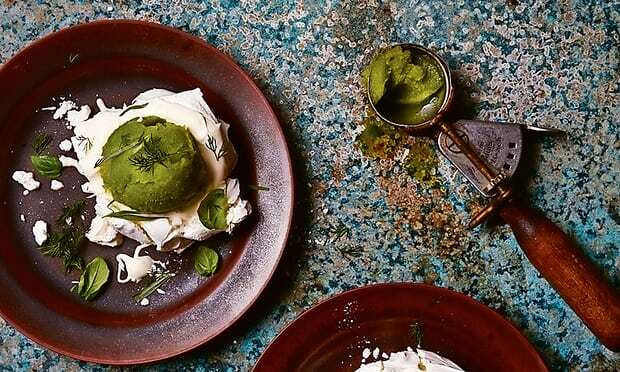 That’s why we were intrigued by Yotam’s Meringue Nests with Apple and Celery Sorbet and Fresh Herbs (x). Give it a shot and let us know what you think. In a medium bowl, whisk the glucose and lemon juice with 60ml water until the glucose dissolves. Transfer to an upright blender (or put the mix in a deep bowl and use a handheld stick blender) and add the celery, apple, parsley, tarragon and basil. Blitz smooth, then pass through a fine sieve, pressing through all the juice; you should end up with about 550ml of liquid (discard the pulp). Transfer the liquid to an ice-cream machine and churn for about 30 minutes, until semi-frozen (or put it in a suitable container and freeze, giving it a good stir every half-hour or so, until soft-set). Transfer the ice-cream mix to a chilled freezer container, cover and freeze for at least three hours. Now for the meringue. Heat the oven to 120ºC/250F/gas mark ¼. Spread out the sugar on a small baking tray and roast for four minutes, to warm. Put the egg whites in the clean bowl of an electric mixer and whisk on a medium speed until they foam up. Slowly pour in the sugar and continue whisking for at least five minutes, until you have a firm, glossy meringue mix. Add the vanilla, then stop the machine. Put six large even-sized spoonfuls of the meringue mix on an oven tray lined with greaseproof paper and bake for 50-60 minutes, until the meringues are hard on the outside but still a bit soft inside. Remove the tray from the oven and leave the meringues to cool completely before lifting them off the tray with a palette knife. Twenty minutes before serving, remove the sorbet from the freezer, so that it will soften slightly. Place a meringue on each plate and gently crack open the centre (don’t worry if it breaks up a bit– it’s all part of the dish’s charm). Spoon creme fraiche into the middle of each meringue and top with a scoop of sorbet. Scatter over some tarragon, basil and dill, and serve. For other recipes to help you celebrate the New Year, check out our recipe section. And you can also check out more of Yotam’s stuff over here. Happy New Year!